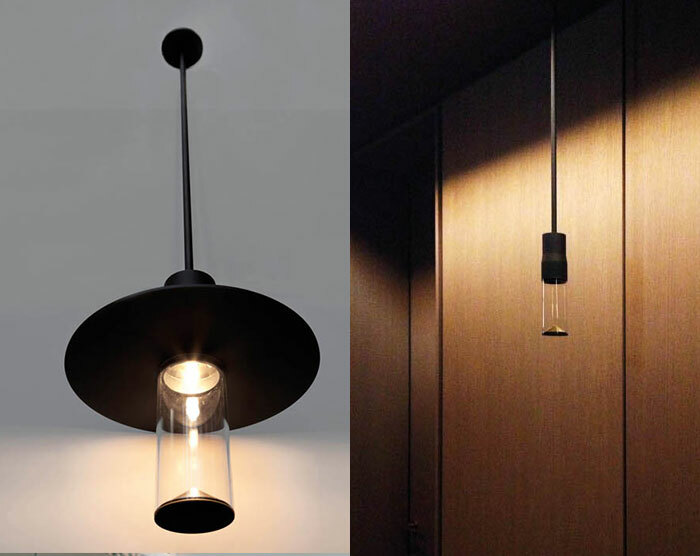 IP20 rated suspension light fitting for interior use, made of my bianco, nero royal painted aluminium or made in copper bronze brass. dimensions profile: available in 100mm, 80mm and 60mm. consists of a splayed cylindrical body and a cylindrical transparent pyrex glass. the glass is closed using a reflecting cone that generates indirect light. it is attached to the ceiling using a special rose with a 655 mm long rod. for each diameter additional discs in the same finishes are available having a diameter of 500mm, 400mm and 300mm, to be interjected between the glass and the cylindrical aluminium/brass body. royal s 100mm is wired with a B15d 60W 250V halogen lamp, or with led source (power supply not included). royal s 80mm is wired with a G9 28W 250V halogen lamp, or with led source (power supply not included). royal s 60mm is wired with a G9 18W 250V halogen lamp or with led source (power supply not included).